Purposeful mechanical, electrical, and plumbing design can enhance your market position by decreasing costs and improving ROI. By Andrew Lasse (MultiFamilyExecutive.com Article) — In the competitive multifamily industry, developers are always seeking ways to enhance their market position. At the same time, with costs rising for labor, equipment, and materials, the ROI for every construction project is front of mind. As one way to optimize their rentable/salable square footage and decrease their costs, developers today are exploring new applications in modular design, parking garage configurations, and living-unit arrangements, with strategic mechanical, engineering, and plumbing (MEP) design playing a significant role in each. Optimizing rentable/salable square footage is a key driver of a developer’s project-performance model, and, in general, MEP systems present planning challenges in allocating the significant space they require while still optimizing usable square footage. As a result, project teams will seek creative solutions to optimize available space, both horizontally and vertically. Horizontal distribution systems in particular offer an advantage in minimizing the MEP impact on floor-plan square footage. Horizontal HVAC solutions with distribution in the ceiling, such as variable refrigerant flow (VRF) systems with ducted fan coils, allow designers to regain square footage. VRF systems with HVAC distribution in the ceiling also take up less space than traditional, vertically configured water source heat pumps (WSHPs) or four-pipe fan coil configurations. Pairing this approach with ductwork terminations at the exterior of the building translates to real dollars for developers. Another option is vertically configured, stackable mechanical systems that hug the same wall of directly adjacent multifamily units. Whether these units are WSHPs, vertical terminal air-conditioners (VTACs), or fan coils, when they’re placed at adjacent and/or exterior walls of living units whose plans mirror one another, their configuration offers advantages when it comes to distribution, ventilation, and exhaust by utilizing opposing soffits within the unit. Additionally, these units can share risers and minimize the additional floor space required for the distribution of water or refrigerant systems. This approach has two important benefits: Consolidation reduces the complexity of the distribution within the space, and the effect is less prominent visually on the outside of the building. On the vertical plane, reducing floor-to-floor heights is another area where designers are starting to push—actually compress—the envelope. Vertically, the way to reduce floor-to-floor heights is to decrease the amount of equipment and ductwork in the ceiling space. In a high-rise, reducing the floor-to-floor height by 6 to 12 inches eventually nets the building enough verticality to add an additional floor, substantially increasing the salable square footage without raising the building height. Lower floor-to-floor heights can be challenging, however, when housing infrastructure in the ceiling, especially in wood-framed buildings with tight ceiling spaces. One opportunity to capitalize on space is to run ventilation and exhaust ductwork within the space between parallel joists to the exterior of the building. There are code considerations to consider, but this strategy allows the designer to maintain the higher ceilings while also eliminating shafts that take up salable square footage. Although a wood-frame building is inherently more challenging in minimizing floor-to-floor heights compared with post-tensioning construction, by using the right design integration technique and channeling ductwork within the routes of parallel joists, it’s possible to get the best of both worlds—higher ceilings and more salable square footage. All of these approaches can increase maximum rentable square footage, but designers need to keep in mind the trade-offs involved and how their designs might affect resident comfort inside the units. On a side note, generator systems in high-rise construction are a hot topic. Questions about the cost-effectiveness of having one versus two generators, mitigating noise, and managing radiator exhaust and supply are all part of the discussion. Complex coordination is a challenge and the planning for generator systems can all too often be an afterthought. Instead, it must be a top priority very early on in the project, with a detailed plan for seamless integration. 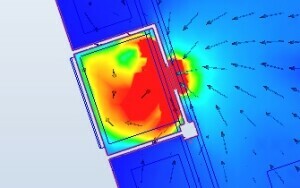 Courtesy Interface Engineering One way to reduce cost and congestion within parking garage ceiling space is to model the garage exhaust and fresh-air supply using CFD (computational fluid dynamics), as shown in this example. In a large development, you can optimize square footage and reduce construction costs by decisively planning the MEP within the parking structure. One of the key goals when building a multifamily parking garage is to reduce excavation depth and, by proxy, floor heights, which puts pressure on ductwork, piping, and electrical configurations. Because material and labor costs can vary widely among contractors, it can be advantageous to use a design-assist approach to achieve this objective. By soliciting feedback from the GC and subcontractors during the design phase, developers can accurately estimate the MEP budget as well as refine the materials selection. For example, contractors will be aware of current pricing for copper versus stainless steel piping, or they can determine the price differences between a ducted ventilation system versus a transfer fan in a garage, which provides real-time feedback in identifying the most cost-effective design approaches. Establishing these relationships at project outset reduces change orders later in the project, increasing both speed and quality. Another way to reduce costs and congestion within the parking garage ceiling space is to model the garage exhaust and fresh-air supply using CFD (computational fluid dynamics). Using advanced software analysis, the model reveals how transfer fans can perform against a traditionally ducted system while also resulting in a more predictable performance outcome. In a recent project, when fan locations were adjusted per the model, transfer fans were placed in a seemingly random configuration to achieve what resulted in an optimized uniform ventilation configuration—a solution counterintuitive to a more expensive, evenly spaced fan placement with twice as many fans. This wouldn’t have been realized without the benefit of CFD. The result required less fan horsepower, and the major savings were threefold: reduced ductwork, nearly half the number of installed fans, and long-term energy savings for the owner. An additional emerging trend to optimize space efficiency is the use of parking stackers. By incorporating a parking stacker system, developers can reduce the depth of excavation, and a smaller footprint means less infrastructure: lower MEP and, specifically, HVAC costs associated with the project. Modularity is another way to speed construction and reduce costs that’s gaining momentum among multifamily developers. In many cases, it’s less expensive to procure and install MEP systems within living units in a manufacturing setting than to assemble the components at the jobsite. Developers should also be aware of the extra layers of complexity involved in the permitting process for modular designs. One of the primary challenges with modularity is in project coordination. In conventional design and construction, the working relationships are between the architect and contractor. Bringing in a third-party expert in modular design adds another layer to your team coordination efforts. The best way to get as much of the MEP system as possible installed as part of the modular manufacturer’s scope of work is compartmentalization. For example, with electrical systems, a unit may have two or three modular sections that make up one residential unit. This can be complicated because there’s a single, shared electrical panel with conduit and wiring routed to the other modular sections. The best approach is to route as much conduit as possible into the panel and have junction boxes that terminate at the edge of the modular connections rather than assembling all the conduit wiring within one unit and leaving the remaining connections to be routed later in the field. In this way, installation is done by the modular contractor in advance, making field installation easier. On the HVAC side, self-contained systems are very efficient for modular projects. However, split heat pumps with remote condensing units also work well for these types of projects. If roof space is a concern, VTAC (vertical terminal air-conditioning) units can replace the remote condensing units on the rooftop, freeing up space. Individual exhaust systems could also be run horizontally, minimizing the vertical shaft systems that both take up space and add a layer of coordination due to their complexity.